CHICAGO (Reuters) - Scientists have shown conclusively that treatment not only improves the health of people infected with HIV, it also stops transmission of the virus that causes AIDS. That public health issue is just one of the challenges Republicans face as they attempt to overhaul the Affordable Care Act, a law that brought health insurance coverage to some 20 million people - including tens of thousands of Americans living with HIV. Lawmakers are currently considering repealing the massive 2010 U.S. health reform law known as Obamacare as soon as this month. But the roadmap is tentative, and complicated: it would keep the Medicaid expansion and the new individual insurance plans in place and delay major changes for up to three years. This would give Republicans more time to craft a replacement plan, but it is not clear if individual insurance prices would skyrocket during the delay or what the new coverage will look like. HIV experts are among the groups, including insurers and hospitals, that have started lobbying lawmakers. They want to keep the current level of insurance coverage in place and say that even "repeal and delay" would disrupt care, put patients in jeopardy and increase the risk of transmission of a deadly communicable disease. "The evidence is iron-clad that when people with HIV are treated and their viral load is suppressed, their likelihood of transmitting HIV goes down to almost zero," said John Peller of the AIDS Foundation of Chicago. "So, any kind of interruption in care is going to result in more cases of HIV." 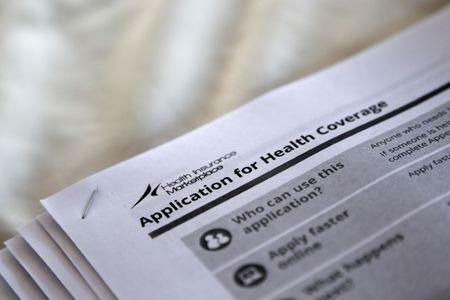 In Illinois, one in three people with HIV gained coverage through Medicaid expansion or the new individual insurance plans created under the ACA, according to an analysis compiled for Reuters by the AIDS Foundation of Chicago. The number of HIV-positive individuals covered by Medicaid in Illinois rose by more than 50 percent between 2013 - the year before the new healthcare coverage went into place - and 2016, when 13,694 people with HIV were enrolled. HIV experts in Republican states have already been wrestling with the issue of caring for patients with HIV. Earlier this year, North Carolina became the 48th U.S. state to permit the use of federal grant money via the Ryan White HIV/AIDS program to pay insurance premiums for people with HIV. "We're late to the party, and now the party may be over," said Allison Rice, director of the Health Justice Clinic at Duke University School of Law in Durham. Insurers, including UnitedHealth Group and Aetna , pulled out of Obamacare exchanges for 2017. The plans are offered to everyone regardless of their health and cover everything from routine check-ups and emergency room visits to organ failure and cancer, and insurers said costs of doing that were higher than expected. "It creates a really difficult environment for insurers to commit to the market," said Carmel Shachar of the Center for Health Law & Policy Innovation at Harvard. Shachar co-wrote a letter signed by 174 national, state and local HIV organizations urging members of the senate not to repeal or modify the Affordable Care Act without a clearly defined replacement plan. That was followed by a letter on Tuesday sent by more than 950 HIV medical professionals urging Congressional members not to repeal the Affordable Care Act without a viable replacement plan, and to sustain the federal commitment to the Medicaid program. "In most states, prior to the ACA, low-income patients with HIV were denied Medicaid coverage until they became sick and disabled, and did not have the resources to participate in health savings accounts," the group, which included the HIV Medicine Association, said in a statement. America’s Health Insurance Plans in December said an immediate repeal of federal support - particularly federal cost-sharing programs and Medicaid expansion - would jeopardize care for millions of Americans and disrupt market stability. Vice President-elect Mike Pence told Republican lawmakers on Wednesday the transition team is "mindful of disrupting the market," but signaled that a replacement plan would not be in place at the time the law is repealed. "The first order of business" was to "repeal and replace Obamacare," Pence told a news briefing, adding that "the architecture of the replacement" would come together "in the weeks and months ahead." Before the ACA was passed, only about 13 percent of people with HIV had private health insurance and 24 percent had no coverage at all, according to the Department of Health and Human Services. Medicaid, which provides insurance for low-income individuals, is the largest source of insurance coverage for people with HIV, covering more than 40 percent of HIV-positive individuals, Kaiser Family Foundation estimates. In the 31 states plus the District of Columbia that expanded Medicaid under ACA, the law eliminated rules that prevented all but pregnant women and the disabled from gaining coverage. "Obviously, not every state expanded Medicaid, but for the vast majority that did, this was the single most significant piece of the Affordable Care Act for people with HIV," said Amy Killelea of the National Alliance of State & Territorial AIDS Directors (NASTAD). Another 25 percent of people with HIV are covered by Medicare, the U.S. insurance program for the elderly and permanently disabled. Nationwide data on how many of the 1.2 million HIV-positive individuals in the United States gained coverage through the ACA are still being tallied, said Kaiser health policy analyst Jennifer Kates. But policy experts say the impact has been dramatic. "A lot of what the ACA did that is kind of below the radar is incredibly important to people living with HIV," said Matthew Kavanagh, a policy analyst at Health Global Access Project in Washington. Before the Affordable Care Act, he said, people living with HIV "had huge problems accessing medications and insurance." In non-expansion states, many people with HIV got their insurance premiums for Obamacare plans paid through the Ryan White program, a federal grant program established after the death of the Indiana teen in 1990 of AIDS. The program funds AIDS Drug Assistance Programs (ADAP), which pay for AIDS drugs and insurance premiums for people who are uninsured and underinsured. "It's the main safety net below Medicaid, below Medicare, below private insurance," Kates said. Even if the Affordable Care Act were repealed in full, Ryan White would be there as a safety net, but the program has a fixed budget each year. In the past, that has resulted in waiting lists. In September of 2011, nearly 9,300 people were on ADAP waiting lists nationwide, NASTAD data show. Killelea said her group intends to work with members of Congress and the new administration to "underscore the public health and individual health impact" the ACA has had on people with HIV. "The ACA opened up new choices for people who were frankly uninsurable in the United States prior to the ACA."